More than 50 Lutheran and Orthodox Christian clergy and laity from the Eastern and Midwestern United States, some from as far away as Iowa, Missouri and New York, attended Faith of Our Fathers: A Colloquium on Orthodoxy for Lutherans Sept. 10-11, 2007 sponsored by St. Andrew House Center for Orthodox Christian Studies. Fr. Patrick Henry Reardon from All Saints Orthodox Church in Chicago was the Master of Ceremonies. The colloquium was designed to explain Orthodox Christianity to Lutheran clergy and laity, according to the Most Rev. Nathaniel, Archbishop of Detroit and the Romanian Episcopate of the Orthodox Church in America (OCA), and founder and president of St. Andrew House. 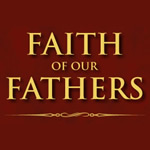 Ancient Faith Radio recorded the sessons and is happy to make them available for download. Please do not make copies or sell the material without the consent of the St. Andrews House Center for Orthodox Christian Studies. Professor of early modern history and religious studies at Penn State. Formerly with Lutheran Church Missouri Synod. A talk by Reader Christopher Orr, born and raised Wisconsin Evangelical Lutheran and received into Orthodoxy in 2001. He is an associate at Heidrick and Struggles, an executive search and leadership consulting firm.